This legendary Barcelona boat party that has been running for over 7 years and will give you and the guys some truly unforgettable Mediterranean memories. Your evening will kick-off at one of Barcelona’s best “chiringuitos”, or beachside bars at Coconut Club. While the crew are preparing your vessel, you and the guys will be able to enjoy some beers before boarding. From here the you will make your way to the ship and begin your epic 2-hour cruise! The DJ will start to get the music pumping as you tear away from Barcelona’s beautiful coastline and tuck into your unlimited drinks! Golden sunshine will be beating down on you and up to 147 other party animals – prepare for lots of drinking games! If all of this doesn’t sound perfect enough, you and the guys will also have VIP entrance to one of Barcelona’s best nightclubs. To ensure you guys capture your amazing moments there will be a photographer on the boat too, snapping pics along the way as you bounce across the blue waves of the Mediterranean! 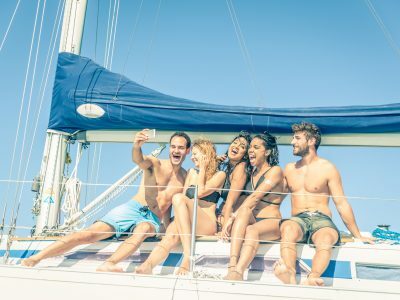 Of course everyone has different tastes and if you and the guys fancy experiencing the boat life in a little more mellow way contact your party planner to consider some alternative options!